This week Peter Eells the Head Brewer at the famous Timothy Taylor’s brewery at Keighley, West Yorkshire came to visit the Ragus refinery. Head Brewer Peter Eells with Ragus Factory Manager Mel Boyle. 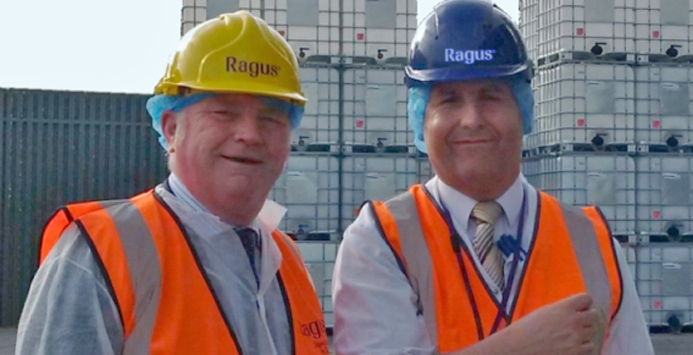 Timothy Taylor’s is a long-time customer of Ragus and both companies are a leading example of what can be achieved by British businesses when a commitment to quality is maintained. In 1858 Timothy Taylor began brewing beer in Keighley. The superb spring water that wells up from deep within the Pennines is still used today in the process. The brewery still brews cask ale in the way it has always been done. ’Taylor Taste’ is achieved by using only the finest natural ingredients, taking pride in the brewing process and allowing full time for the ales to ferment and mature, thereby creating a unique range of beers. This commitment to quality is the reason Timothy Taylor’s buy Ragus Brewers No.2 made from the finest Demerara sugar to use in all its beers. Landlord bitter is the favourite tipple of singer Madonna who has 72 pint firkins delivered direct to her home in Wiltshire, Hugh Grant the actor is also a well known fan.